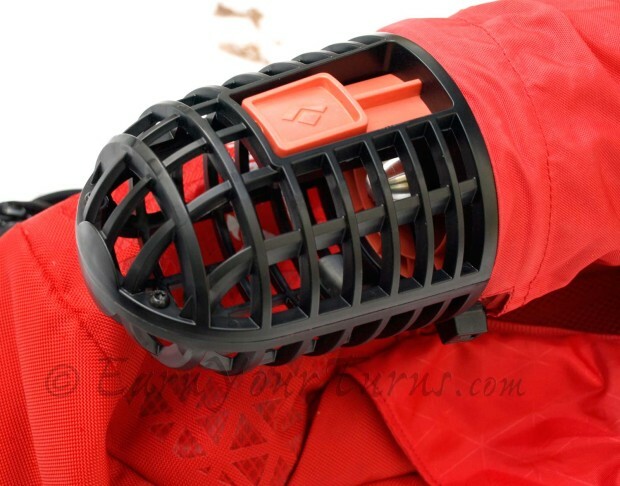 Black Diamond and Pieps have created a major revolution in avalanche airbag backpack technology by using a fan and battery in place of a compressed air cylinder. 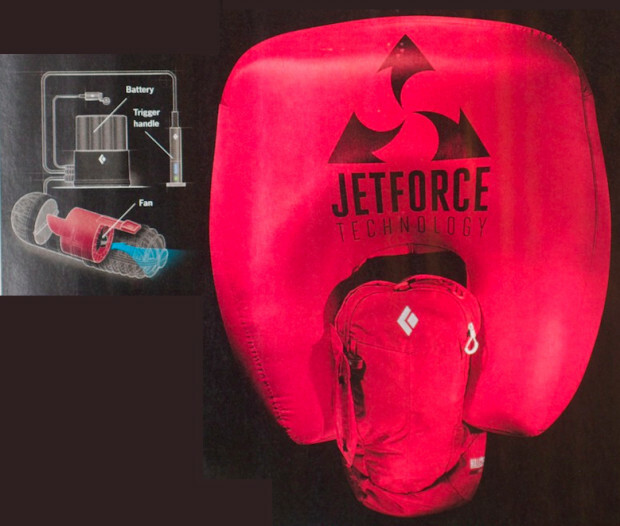 Their new system is called “Jetforce.” The Jetforce avalanche airbag backpack uses batteries and a fan to fill their airbag in place of a compressed air cylinder. Conventional avalanche airbag technology uses a compressed air cylinder to quickly deliver air into an airbag in your backpack once triggered by the user. This compressed air can only be used one time. Once used, the compressed air cylinder has to be refilled at a filling station which can cost up to $30 to fill (I paid $20 at a Tahoe ski/bike shop recently). Compressed air cylinders are illegal to fly with in the United States of America as well as some countries in Europe and possibly more. We’ve heard that around 5-15 compressed air cylinders from avalanche airbag backpacks are confiscated everyday at the Zurich airport in Switzerland during the peak of the winter season. There are some distinct advantages to a battery powered avalanche airbag. 1. Travel: You can fly with this avalanche airbag backpack anywhere in the world as opposed to the compressed air cylinder that is illegal to fly with in many countries. 2. Practice: You can practice triggering your airbag as much as you like because it costs nothing to refill this airbag system. The batteries are rechargable, so you can practice pulling the trigger at home or in mock avalanche situations. 3. System diagnostics: When you initially turn on the system, it does a system diagnostics test and lets you know if the system is functioning correctly or not. 4. Punctures & Tears: You can recover from punctures and tears in the avalanche airbag because for the first 3 minutes, the fan pulses on and off making sure that airbag remains inflated despite any holes that might be in the bag. This system can reportedly overcome a 7 inch tear in the airbag. 5. Larger Airbags: With this system, air supply is essentially infinite. Therefore, this system can afford a larger airbag. A larger airbag is going to give its user more float and more impact protection from the sides, back, and rear. 6. Airbag Deflation: After 3 minutes of having the bag inflated, the fan switches into reverse and deflates the airbag. This does 3 things: 1. In a full burial, you’ll have a large, 200 liter air pocket right behind your head. Air pockets are the difference between life and death in longer full avalanche burials. 2. In a partial burial (this means your airway is not buried), you’ll have room to potentially wriggle and free yourself after the airbag deflates as you’ll have additional room after deflation. 3. This makes the airbag very easy to repack as the air has been sucked out and you just have to pack it back into its designated pocket. 7. Repacking the Airbag: There is no special way to repack this airbag, no folding at all. Just cram it back into the airbag pocket, zip it up, and move on. 8. Multiple Inflations: You can inflate your airbag multiple times in one trip. With this system, you don’t have to think twice about triggering your airbag. If you get scared for any reason, you can pull the trigger and activate the airbag. If nothing happens, you can quickly repack the airbag and be ready to deploy the airbag a second time right away. The battery life will allow for around 3 to 4 airbag deployments per charge. 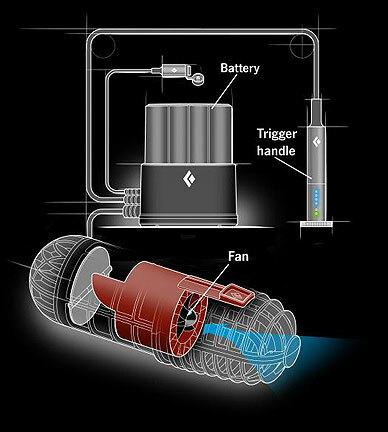 Inflation system with battery, trigger, and fan. 1. Battery power will reduce in very cold temperatures. 2. Lithium batteries deteriorate with age. 3. Potential for electrical system to malfunction. 4. This technology will clearly improve remarkably in coming years. 5. On the upper end of the price range of avalanche airbag backpacks. Packs usually run from $500-$1,200usd. The Jetforce will likely cost around $1,100. 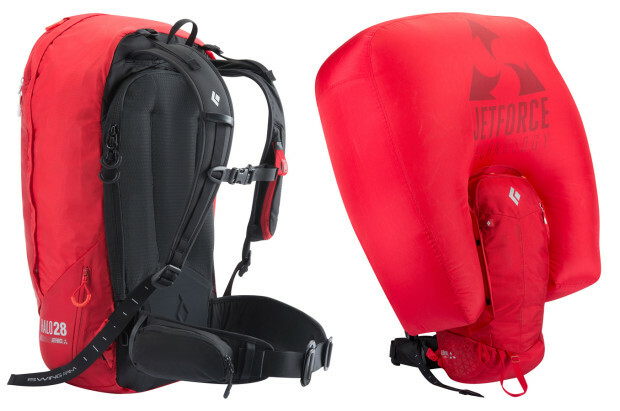 The Jetforce backpack is forecast to be available in fall 2014 at a price of around $1,100.